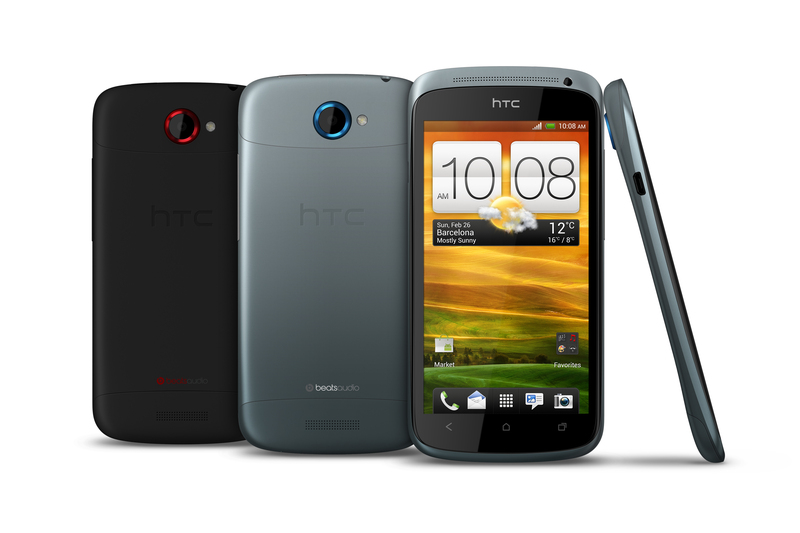 HTC begins 2012 with the reveal of a new unified brand strategy. Although HTC as a company has made significant progress in attaining mindshare, its devices lack a single focus to compete with the likes of Apple’s iPhone or Samsung’s Galaxy S brands. HTC, like many of its competitors, chose to spread its brand equity across multiple device brands like EVO, Sensation, Thunderbolt, Desire, and so forth. Moving forward, HTC is hoping to change that with the introduction of a new unified brand to do battle with these other brands: the HTC One. The goal is that you’ll be able to walk into any mobile operator store, in any region, in any part of the world and ask for the HTC One. There will still obviously be variants of the One, but the brand will remain constant across them. Today HTC is announcing the first three members of the HTC One family: the HTC One X, HTC One S and HTC One V. We’ve played with all three phones and they’re easily the best phones we’ve ever seen come from the company. HTC initially allowed no photos of devices, but we'll update as soon as some are released. Note: The performance data contained within this article is based off of preproduction hardware and software. Final performance can (and will likely) change from what you see here. There's a ton of optimization work that still needs to be done, both for performance and stability. We'll of course provide full coverage once we have final hardware in hand. The One X is the new flagship phone from HTC. If features a 4.7-inch 1280 x 720 Super LCD II (not PenTile) display and a quad-core NVIDIA Tegra 3 (AP33) SoC running at up to 1.5GHz. 1080p video encode and decode are both supported. Despite the large screen size, the One X felt perfect in my hand, arguably even better than Samsung’s Galaxy Nexus did. The One X measures 134.6mm x 69.9mm x 9.27mm. Internally the phone features DC-HSPA+ (42Mbps) support as well as dual-band 802.11a/b/g/n. The US version will feature LTE but I’ll get to the differences between that model and the HSPA+ version in a moment. NFC and Bluetooth 4.0 are supported. The One X features 1GB of LPDDR2 memory, the current standard for high-end Android smartphones. The back of the One X is plastic but the phone itself feels dense and very high quality. The phone will be offered in both a white and dark grey, almost black, finish. Overall I was very impressed by the One X, it was definitely one of my favorites of all of the Android phones I’ve interacted with. HTC has been spending quite a bit of time on improving build quality and being a bit less conservative on design, and it shows. The front facing camera is backed by a 1.3MP sensor capable of capturing images at 720p. The rear facing camera uses an 8MP sensor behind a F2.0 lens assembly. The styling of the One X embodies HTC’s newfound focus on simplicity. There’s only a single LED flash on the back but with five different intensity levels. The front features no physical buttons, not too uncommon for a modern Android phone and expected for one running Ice Cream Sandwich. The One X has an integrated (non-removable) 1800mAh battery. If we assume it’s a standard 3.7V chemistry that puts it at 6.66Whr. There’s also no removable storage support, just 32GB of eMMC on-board. On the back of the phone is a dock connector that can be used with an optional car dock. When docked the One X launches a 4-ft UI optimized for operation while driving. All of the icons are larger and you can easily swipe between screens allowing you access to Google Maps, music, and so on. As I mentioned above, the One X runs Android 4.0.3 however HTC has added its own UI customizations on top of it. Sense 4.0 does feature some nice customizations, for example the task switcher is now a Windows Phone/webOS like horizontal list of windows that you can scroll through. Just as is the case with the regular ICS task switcher, you can quit applications from the Sense task switcher - just fling them off the screen (ala PlayBook OS, webOS). The One X has wireless display support, presumably via WiFi Display. To take advantage of the phone’s wireless display you’ll need HTC’s Media Link HD dock. Connect the dock to your TV, enable support on your phone, and then simply perform a three finger swipe up on the One X to launch the Media Link HD app. After doing so, anything on your display will be mirrored, wirelessly to your TV. I’m expecting to see wireless display featured in many of the high-end Android smartphones released in 2012. HTC has partnered with Dropbox to provide all HTC One (not just the X) owners with 25GB of free storage for two years. Access is integrated with Android via HTC’s Sense layer. 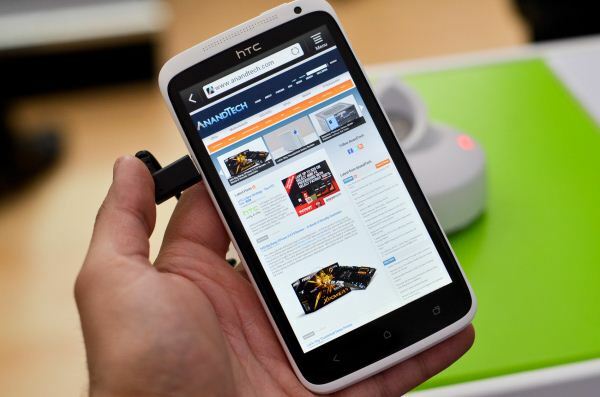 Although the standard HTC One X features NVIDIA’s Tegra 3, the version headed to AT&T drops Tegra 3 in favor of Qualcomm’s MSM8960 with integrated LTE. The dual-core MSM8960 runs its Krait cores at up to 1.5GHz. Although it has fewer cores than the One X, each individual core should be faster. It remains to be seen how the two compare from a battery life standpoint (NVIDIA’s companion/battery saver core at 40nm LP vs. lower power consumption from Qualcomm’s 28nm LP process), but performance should be comparable at worst. 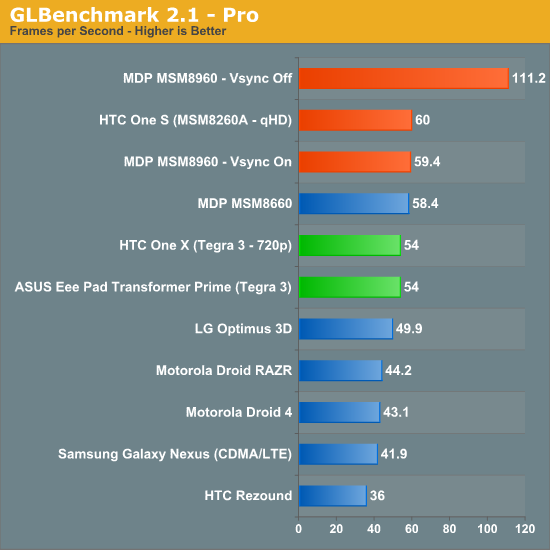 If we look at GLBenchmark, NVIDIA has a GPU advantage, while Qualcomm likely holds a single threaded CPU performance advantage. Overall I’d expect the tradeoff to be worthwhile, particularly as MSM8960 delivers integrated LTE, but we’ll find out for sure in the next 60 days as both phones become available. Other than the difference in SoC and baseband, the One XL and One X are identical. Moving down the lineup is the HTC One S, but you don’t give up performance to get here. The One S trades in the Tegra 3 or MSM8960 for a Qualcomm MSM8260A, another Krait based 28nm SoC but without integrated LTE. 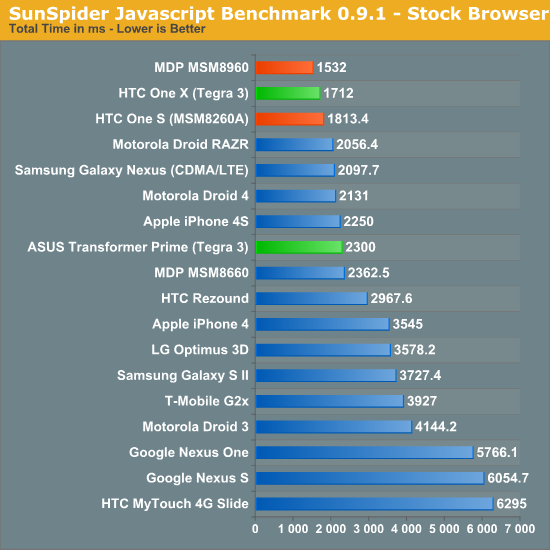 The CPU cores in the One S also operate at up to 1.5GHz, making its performance identical (in theory) to the HTC One XL. The body moves from plastic to aluminum and drops in thickness to a mere 7.9mm. The overall dimensions shrink as well to 130.8mm x 64.8mm. The screen shrinks compared to the One X/XL down to 4.3-inches. The Super AMOLED (PenTile) panel features a 960 x 540 (qHD) resolution. The front facing camera drops to a VGA resolution, while the rear facing camera (and lens assembly) remain unchanged from the One X. Battery capacity drops to 1650mAh (6.105Whr @ 3.7V), but power requirements should be lower as well thanks to the smaller, lower resolution screen. Like the One X, the S features 1GB of LPDDR2. Storage capacity drops to 16GB of eMMC on-board but you still do get 25GB of free storage via Dropbox. 1080p is supported on both the video encode and decode. In an attempt to deliver a uniform camera experience across the HTC One X and S, both feature a discrete Image Signal Processor (ISP) to handle camera sensor output. Rather than relying on the integrated Tegra 3 or Qualcomm ISPs, HTC uses its own ISP called ImageChip for all processing. It’s unclear to me how the external ISP interfaces with the SoC, nor how HTC can guarantee sufficient memory bandwidth to it. As HTC enters the realm of purchasing SoCs from multiple manufacturers, ImageSense is a unique (albeit costly) way of guaranteeing a consistent experience across all devices. 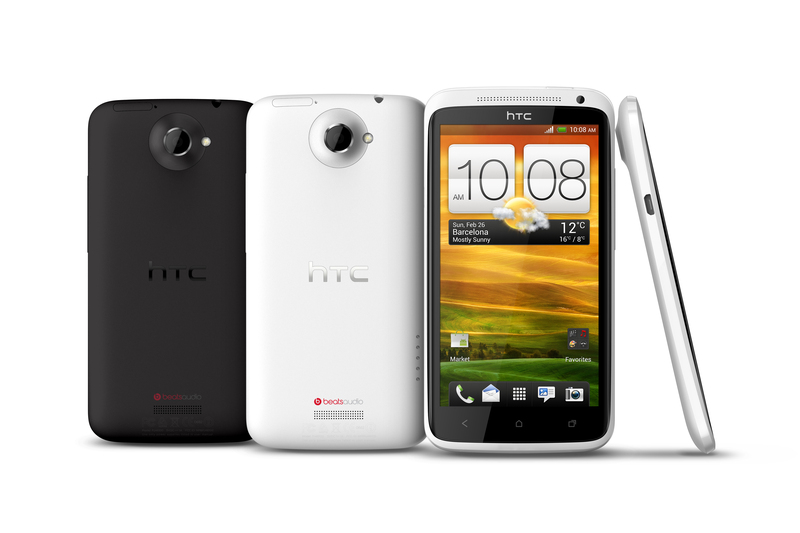 HTC claims its ImageChip enables phones equipped with it to capture images in 0.7 seconds and autofocus in 0.2 seconds. Burst mode is supported as well. The Sense 4.0 camera app has been greatly improved as well. Video recording now begins immediately upon switching modes from still to video. You can also now capture full sensor resolution images in the middle of recording a video without switching modes by tapping the camera capture button. Finally bringing up the low end we have HTC’s One V. The V uses an aluminum unibody design borrowed from the old HTC Legend. Based on a single-core Snapdragon S2 running at up to 1.0GHz, the One V is headed for lower cost regional carriers in the US with availability in late Q2. The One V has 512MB of memory and 4GB of eMMC on-board with a 1500mAh battery. 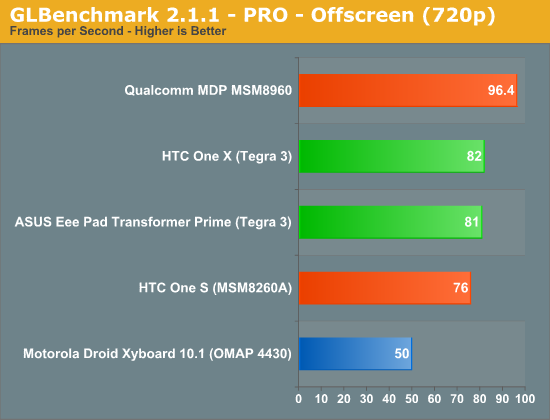 We were able to spend some time benchmarking the One X and One S, the results are below. Note that these phones are running preproduction software, the performance you see here isn't final. In the ~60 days between now and launch you can expect to see a lot of performance and stability tweaking across all of these phones. 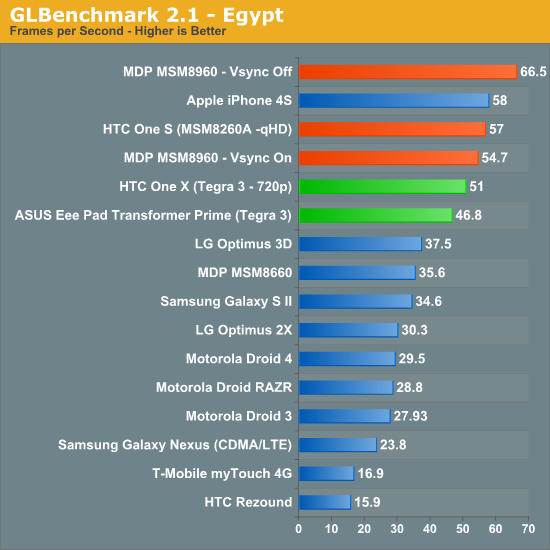 While the above results were taken using GLBenchmark's offscreen test which disables vsync and runs the benchmark at 1280 x 720, the graph below is run at each device's native screen resolution. For the HTC One X that works out to be 1280 x 720 (921K pixels) and for the HTC One S that is (518K pixels). Keep that difference in mind as the One X does have more (around 77%) pixels than the One S.
The One S (MSM8260A - dual core Krait 1.5GHz) performs surprisingly close to our MDP MSM8960 in many tests. The software build on the One S was pretty immature, it was apparently 10 days old at the time I ran these numbers. We should have time with a device tonight that uses a newer build. 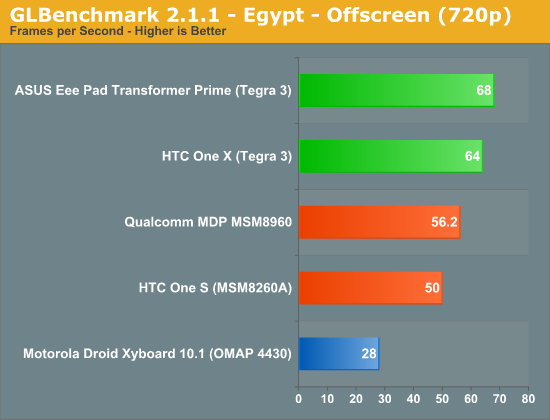 The Tegra 3 equipped One X performed very well, easily equaling the Krait based SoC in the browser tests. It remains to be seen how these two SoCs compare in real world browsing tests however. 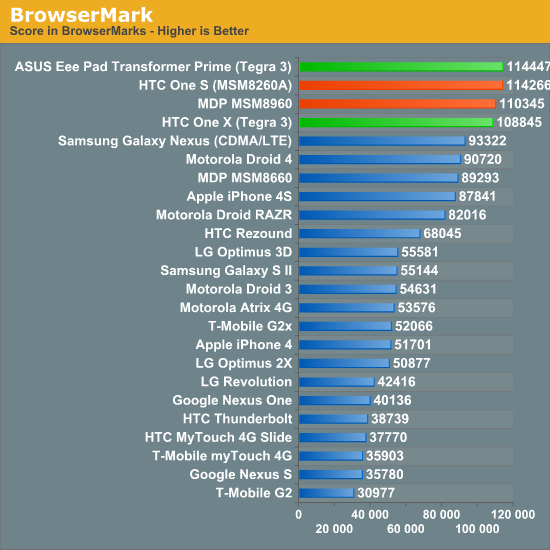 NVIDIA continues to have the advantage in GLBenchmark, and unfortunately due to time constraints we weren’t able to run Basemark on the devices. HTC's strategy here makes a lot of sense for a host of reasons. First, having a concise and easy branding message makes execution and marketing simpler - just look at the success of Galaxy S II - you can't do that without a unified message. Handset makers really only get one or two opportunities in a two year contract to drive that unified message home, and HTC's new One strategy is the realization of this reality. In addition, doing this on a platform across different SoCs is no longer a huge no-no when the performance margins are narrow enough - Samsung does it, Sony is doing it, and so forth. HTC is going figuratively all-in with this strategy, but the dividends won't start to become readily apparent until HTC One devices start showing up - at this point it does seem like a solid strategy. The difference with Samsung, Apple etc is that they have other products; computers, monitors, washing machines and whatnot. Therefore Galaxy and iPhone is family names are a must. HTC on the other hand could have just stop releasing 100 variants of the same phone with different names for different markets. They could easily have had Sensation as the Desire 2, One X as Desire 3, One V as Legend 2, Etc. 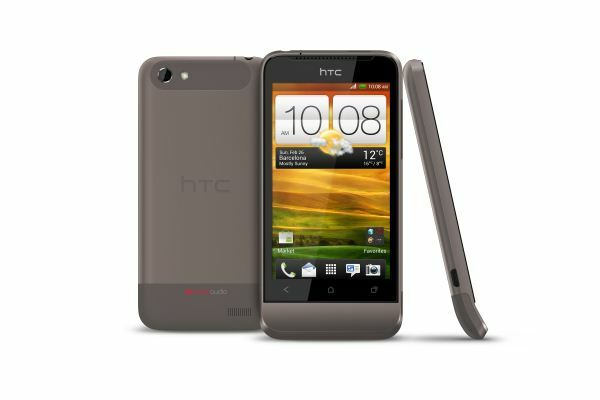 No microSD is a deal breaker for me and HATE HTC for it.Other than that,very nice phones. Just curious, what's the reason for wanting a microSD card slot? I see a lot of people demanding them but I'm not sure of the benefits of that over onboard storage. Also can anyone tell me how apps are handled these days with Android? I have a Desire and app storage is a real mess with different partitions and so on. The problem is that if I am in America, on T-Mobile, and want the One S I will be stuck with 16gb of storage. Basically they are making storage space a factor in the purchase of the phone when it does not have to be. I have never thought that to be wise. Even Apple offers multiple capacities for their phone, knowing that they should not be making it harder for consumers. But we will see how that goes. The original Desire was a mess when it came to storage. I assure you your experience will be better now. I see, I had assumed wrongly they would offer different onboard storage sizes. They should have a choice. Having a microSD means, at a minimum, 32GB of additional storage for around $30 (USD), plus the option of upgrading to a 64GB card for more, or swapping in other cards for more media content. Compared to the iPhone, which changes $100 for 16 or 32GB upgrades, it massively increases value. The only inherent value is that it serves as a local but separate backup in case your phone fails and you can't access the internal storage for whatever reason. Generally, apps on Android are stored in a partition of the internal storage. Most apps can be moved to the sd card, but that can be disallowed and some apps can get messed up if you do it. Still, it really isn't an issue on modern phones. My phone's app partition is a couple GB and I'm nowhere close to filling it with a zillion apps. I see, I never do those things as I just purchased one microSD card and haven't touched it since, but I see there are benefits for people that use them like that. Do even phones with onboard storage have a separate app partition? What is the reasoning behind that? With the iPhone you can fill all 64GB with apps if you wish, which is plausible as many games are over 1GB each, I have over 10GB of iPod touch apps on my computer and that is only ones I didn't want to delete. You don't get apps of that size with Android though I guess. The advantage of a separate partition on embedded storage is, for me at least, USB Mass Storage Mode. Unified storage, at least on Android, only allows the use of MTP and PTP (Media/Picture Transfer Protocol) which is extremely limited in comparison. "Just curious, what's the reason for wanting a microSD card slot? I see a lot of people demanding them but I'm not sure of the benefits of that over onboard storage." The two aren't mutually exclusive, you have both onboard storage and expandable storage giving you the best of both worlds. I have a Galaxy Note with 16GB onboard storage and picked up a cheap 32GB micro SDHC card which means I can dump all the large video files and similar onto the memory card. If I wanted I could have picked up a 64GB micro-SDXC card which would take the Note's memory 16GB beyond the largest Iphone and if it works with the 128GB cards, further than the next IPhone as well. HTC at least up to the Sensation frustratingly rely on a memory card and a small amount of onboard memory for applications which I find can be a pain in the neck to work with. There's also the advantage that if the phone dies due to failure or accidental damage, there's a good chance you can get the micro SD card out and keep a good chunk of your data (or all of it if using the SD card to back up) whereas if everything is onboard and the phone is dead then you're probably stuffed. Given the tiny size of the micro SD cards I can't see it being that difficult to implement on these large phones and there's so many benefits, it's worrying more and more seem to be skipping the expandable memory.